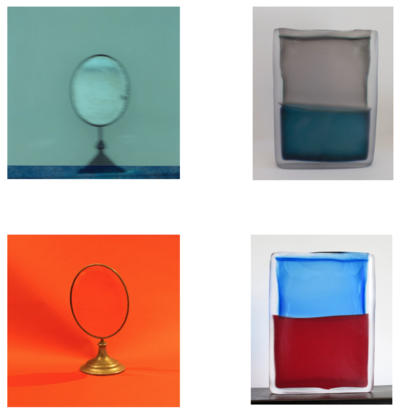 Our exhibition examines the remarkable visual parallels between Jeannette Montgomery Barron's photographs of mirrors and Laura de Santillana's glass sculptures. These two artists were born one year apart - Laura de Santillana in Venice, Italy, and Jeannette Montgomery Barron in Atlanta, Georgia - and both have worked continually between the U.S. and Italy. Without knowing one another's work until very recently, the two artists have steadily developed a minimalist aesthetic and an exploration of color through repetition of form. This is the first time their work has been exhibited together.